airstream, travel, full-time RV, road trip, america. My, how the time flies! We had to do a double-take when looking at the last post from Christmas. Eeeek. Must be more diligent about chronicling our big adventures in the Airstream, especially because we have so many great places on the agenda for this summer. We're on the road now to Alumapalooza 5, and if you're an avid Airstreamer, you've likely heard of this gathering that takes place at the mothership in Jackson Center, Ohio every year. Part campout, part cookout, part rally, part entertainment and part education – all parts Airstream and the people that love them. It'll be our first time at APZ (yes, I totally shortened that for easier typing) and we're very much looking forward to meeting so many fun and interesting like-minded people. A familiar sight on the road. Cha-ching! The drive up from Atlanta isn't terrible but definitely more than we wanted to do in a day. We decided to break up the miles with a weekender in Georgetown, KY, which is right down the road from Old Friends Farm and Woodford Reserve. What a great couple of days. I am a big horse lover and it was such a treat to visit with the sweet souls at Old Friends. These horses are retired thoroughbred stallions – some of them in their late twenties and early thirties. A place like this that takes in "retired" horses (after many people discard them for no longer making money on the track) is good in my book. Their stories are touching and you won't forget your visit with them. Here comes "Mixed Pleasure", making his way down the fence for carrots and sweet talk. Meet Clever Allemont. 32 years old. Deaf, missing one eye. Bless! Loved him. After making the rounds with our equine friends, we wanted to cool down a bit, so we made a beeline for Homemade Ice Cream and Pie Kitchen. Yes, you heard that right. What's not to love? Any kind of pie you can think of, with a side of ice cream. We both chose Dutch Apple with a side of cinnamon ice cream. We chose wisely. Sigh. 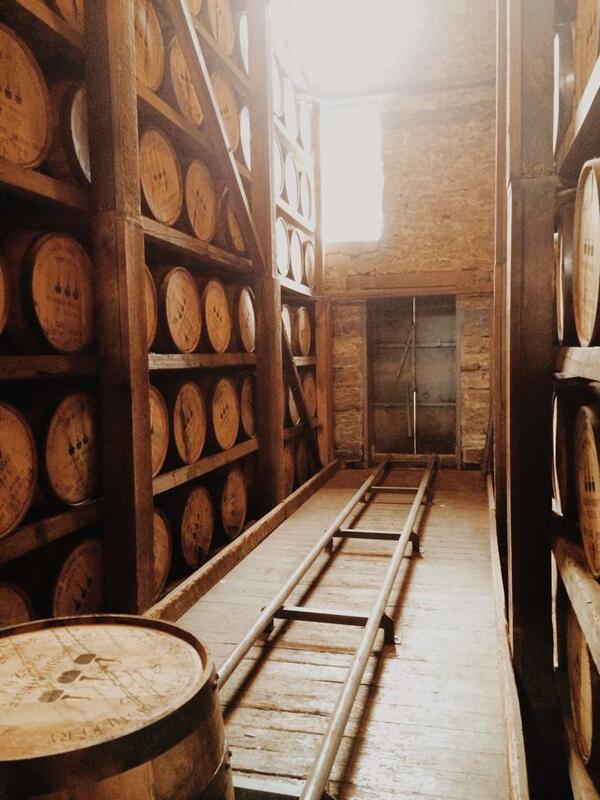 Woodford offers a really nice guided tour and you don't have to be an aficionado to enjoy it. Get there early to get a spot on the tour ($10 a head, yes, it's worth it.) We definitely left with a new appreciation for Kentucky Bourbon and picked up a bottle of the Double Oak on the way out. We'll be hitching up and heading about two and a half hours north in the morning, Ohio bound. Excited for a week of camaraderie with our fellow 'streamers. You can also find us on Instagram (@misspickles and @AirstreamADV) for the latest snaps. See y'all down the road! I don't know about you guys, but we're ready to ring in 2014. Not that 2013 was shabby, but there's just something about a fresh year ahead that feels ripe with opportunity and adventure. Winter is typically a little sleepy in terms of Airstream travels, but we've vowed to make good use of our beloved "Wally" and keep her on the road during these colder temps. We're making plans for a Savannah excursion in mid-January and working on pinpointing somewhere for February. Bring on the hot toddy, please. A perfect reminder for us to get off the sofa and get out and enjoy winter 'streamin'! Whew. Time flies when you're having fun. October has been a busy month of travels – and that's exactly how we like it. I'm admittedly a crafty-junkin'-antiquey-vintage-lovin' sort of gal. And thank goodness Mister M doesn't mind it too much either. We can spend some serious time in junky, dusty roadside shacks searching for time-worn treasure and trinkets. I also love a good outdoor festival, especially in the fall. The sort of day when the air is perfectly crisp and the sky is that shade of unbelievable blue. So imagine my delight to learn that the Country Living Fair was making its way to Atlanta in late October. Country Living is a fab magazine that (despite the name, which can be a little misleading) showcases everything from inspired design, artful and imaginative home decor, crafty goodness, delicious recipes and more DIY than you can shake a glue stick at. It's always on trend and there seems to be a real appreciation for making old things from years past feel new again. Right up my alley. That's a lot of pumpkin pie. The fair was held at Stone Mountain Park (trivia time: did you know Stone Mountain is the largest piece of exposed granite in the world?) and Mister M reserved a sweet little site in the campgroud so we could spend the weekend taking in the fair and the activities in the park. King of the wooooorld, atop Stone Mountain. Much to our delight, Sisters on the Fly was also present and we absolutely loved seeing all of their decorated and glammed out trailers. Those women know how to have a good time, and we were a little sad we weren't on their loop. The fair boasted everything from vintage tchotchkes, jewelry, clothing, woodworking, gourmet treats and just about anything in between. Of course, I was more inclined to linger at the vintage vendors. The styling alone of these booths must have taken hours upon hours and did not disappoint. Antlers, old packaging and a old mail bin? I'm in. Now that Fall is trying to officially ease its way in (and I for one, could not be more excited...I HAVE BEEN WAITING FOR YOU FALL) we've got camping on the brain. Some people prefer the summer for the great outdoors, but to us, that chill in the air that begs for a fire at night is tough to beat. Not to mention, it's cooler for the wunderpup, Gus. We're lucky to be just a short 4 hour drive to gorgeous Asheville, NC from Atlanta. We've been to Asheville plenty of times but the last time we cruised through, we camped at a place called Mama Gertie's Hideaway. I know what you're thinking. I thought the exact same thing. With a name like that, it's got to go one way or the other, right? We weren't sure whether to expect tie dye and incense or Honey Boo Boo and a moonshine still. And that sign! So "Age of Aquarius" right? Thankfully, Mama Gertie's was neither. Instead, we discovered an absolutely wonderful hidden gem of a campground. Close to downtown Asheville, spacious and clean sites, nice attention to landscaping and site design (we stayed "up top" on the bluff overlooking the campground below and it was the place to be) and a super friendly staff. With leafing season about to be in full effect, we crossed our fingers and called to book a weekend away in early October. Success! We snagged the last site available for the weekend, and on our favorite "little hill" to boot. I love it when a good plan comes together. Of course, there's plenty to do in Asheville and the surrounding areas. Junkin' at the Tobacco Barn , biscuits at Tupelo Honey Cafe and scenic mountain views as far as the eye can see. See ya soon, Mama Gertie. Real soon. Wahooooo! You're familiar with Kickstarter, right? If not, Kickstarter is a way for folks to raise money and get funded for creative projects. The public decides which projects they'd like to support and bring to life. I've seen some pretty cool ideas that all started from a Kickstarter page. 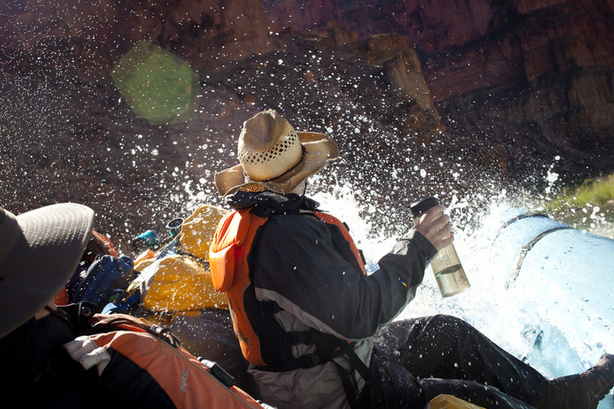 Via Twitter, (which led us to their Kickstarter page) we ran across film director Amy Marquis and the crew behind National Park Experience: A Film Series, and thought you might want to know about it, too. If you're an RVer, chances are you've spent some time in a national park. We've been to a few (although we want to hit more, especially out West) and let me tell you – these are special places. If you've ever witnessed the awesomeness of Acadia or the stillness of Shenandoah in winter, you know what we're talking about. These lands are truly an American treasure, and they're here for us to enjoy, cherish – and if we're smart – protect for generations to come. Check out the project here, and if you feel like making a donation, REI has stepped up and will match all donations dollar-for-dollar, up to $10,000. Nice move, REI. Good luck to Amy and everyone behind this worthy project. We'll be watching! Every year for the 4th of July, Richard gets to pick a camping destination of his choosing because his birthday also falls the week of the 4th. Double the pleasure, double the fun. This year it was decided that we'd hit the lowcountry, the always-a-good-call town of Charleston, SC. Being a native of Atlanta, I grew up going to Charleston fairly often, but I still love the southern charm and grace (and pralines, seriously, the pralines!) of the city. A few of my college friends also call Charleston home so we jumped on the opportunity to spend the week catching up with friends, celebrating handsome hub's birthday and enjoying the holiday weekend. We got incredibly lucky by snagging a last minute site at James Island County Park – a real treasure of a campground. Let me tell you, Charleston County Parks and Rec know what's up. The campground itself is fairly large but books up quickly due to the 10 minute proximity to downtown Charleston. Very friendly and accommodating staff/rangers. Perhaps one of the most awesome features was the off-leash dog beach, located within the campground. If you're a dog owner, you know how fantastic (and rare) this is. Gussie is a big boy and needs off leash time, and when you're out and about on the road it can be challenging to find off-leash dog parks. So we were super pumped about that. There's also a fabulous little water park, yes, within the campground, too. Normally we're not ones to frequent water parks. "Splash Zones!" and "Lazy Rivers!" and such, well, they might as well be called the "E. Coli Express!" or "Urination Station! ", but when it's 90-something degrees out with almost 100% humidity, I will get in that water all day long. All. Day. Long. who is the mystery dude in the reflection? no idea. 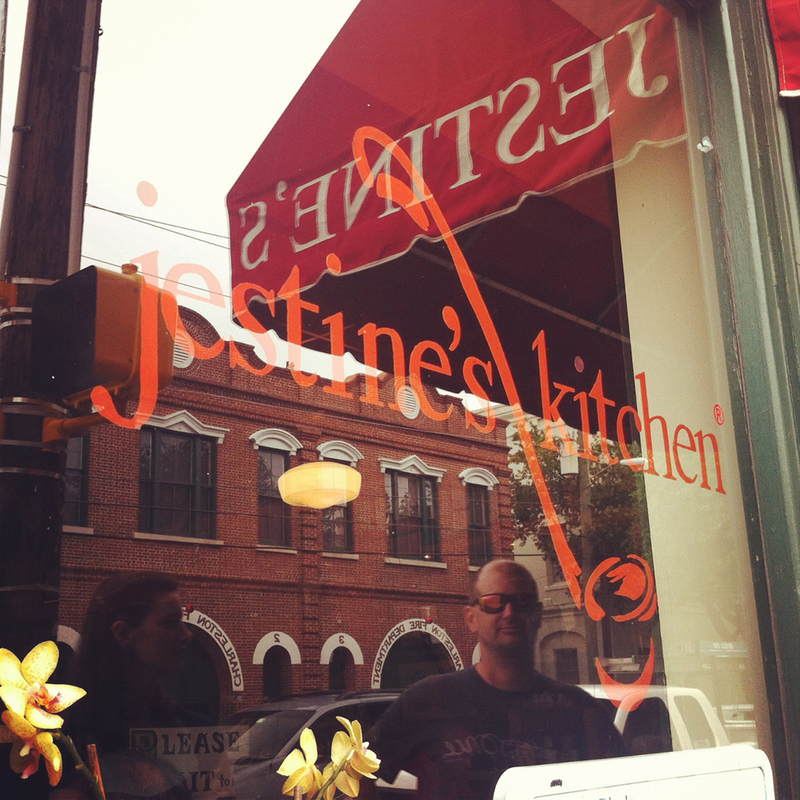 sweet, sweet lord, take us back to jestine's! Fleet Landing is always a reliable choice with great views if you snag a table by the window – which we did – thanks to our good friends Anthony and Lisa. 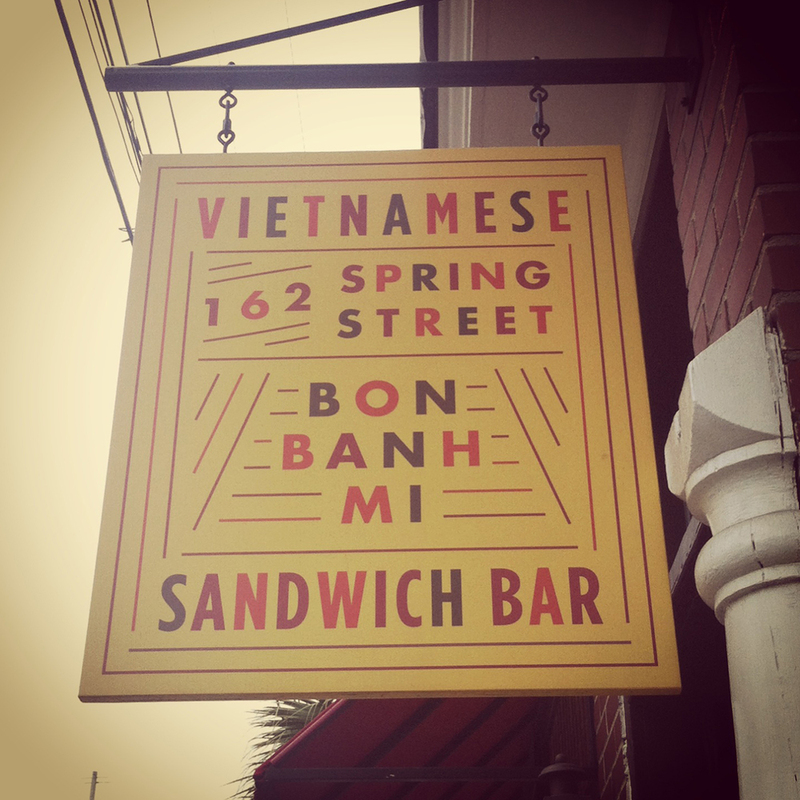 We also hit Bon Bahn Mi for Vietnamese sammies and man, were those things tasty. bon bahn tasty sandwiches for me! Your experience at James Island County Park might differ based on where your site is located. Our original site was quite small and very challenging to get into, so much in fact, that we requested another site and the office graciously moved us even though the campground was packed and it was a holiday weekend. It was also on a loop that just felt cluttered and cramped and I'm pretty sure it was just a matter of time before our site neighbors cranked up Freedom Rock. 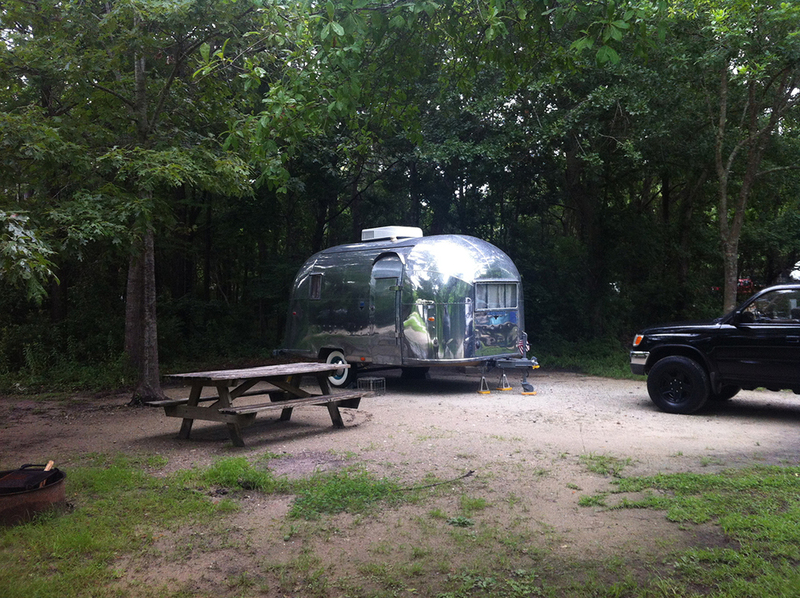 We loved the new site and even had two Airstream neighbors across the road from us. Love that. When we visit again we'll be sure to do a little more research on the site numbers. adorable neighbor! can't beat that mirror shine. The very last day, the sun peeped out and we hightailed it to the beach at Kiawah Island (also dog friendly but only on leash) and it was such a pleasure to have one day of sun. Gus is not a water dog despite our efforts to convince him he should be, but he ain't havin' it. We did manage to get him in the ocean up to his belly but I don't think he loved it. He much prefers hanging under the shady umbrella with Mama and Daddy, paws in the sand, looking around at all the beach goers. Not a bad way to spend the afternoon. Even with the abundant rain, we still had a ball and a change of scenery is always a positive thing. Especially when you can relish the sun going down over the marsh with that Spanish moss in the breeze. Heavenly. I stumbed upon this type print via Pinterest by artist Joshua Noom and it reminded me of that awesome feeling of being out and about, on the road, exploring new places. Never knowing what that next "back yard" will bring. Happy saturday, y'all. We love seeing all the inspiring things other Airstreamers are constantly doing. It's never a huge surprise when we encounter those who are living their dreams in extraordinary ways; after all, that's what draws us all to the Airstream dream, right? The notion of living on our own terms and bucking the status quo. The pursuit of a life filled to the brim with authentic experience and wonder. Our friends over at Mali Mish posted a video today called "Tomorrow Somewhere New" that really hits home for us, and we think you'll love it, too. The short and sweet documentary explores the decision made by 1337stream to live full-time on the road. It challenges the (quintessentially American) notion that you have to have "the house" and "the car" and the "stuff" to be happy. How much do we really need to be happy? What's more important? Things or experiences? To keep things real, in order to pull off full-time Airstream living, one does have to have that thing called "a job", and not everyone has the ability to hit the road and work virtually. So yeah, there's that. But like anything else, where there's a will there's a way. Traveling full-time is a lifestyle shift. Making do with less and making more of what you have. My personal mantra has always been "fortune favors the bold." Hats off to Josh and Jessa at 1337stream for taking that bold step into life on the road. It ain't always easy, but it's always worth it. the mothership. take me to your people...to fix this damn trailer. late spring of this year we found ourselves in a troubling situation that would make any airstream owner's knees buckle. we'd noticed a soft, spongy place in our floor next to the dinette. ruh roh. Y'ALL. it was bad. we feared we'd step right through it. it could only be one thing: FLOOR ROT. needless to say, a 2008 trailer should not have any flooring issues. we've always taken pride in our trailer and bought an airstream because of the quality and craftsmanship of the product. clearly, this was unacceptable and something had to be done, and quickly. we researched a good bit of information online and gathered advice from anyone who would give it – namely, sonny hare from camper clinic in montevallo, AL, and vinnie lamica, of vinnie's airstream repair in the san francisco bay area – both of these guys know their stuff. (and a big thanks to longlonghoneymoon.com for the recos.) clearly, this was a manufacturing defect caused by water leaks that needed to be addressed by the airstream factory in jackson center, ohio. anyone that knows me well knows i am a crazy woman when it comes to customer service. i'm not a diva and i'm not rude, but if a company doesn't deliver what is promised, i kind of turn into a fire-breathing customer service vigilante, righting the wrongs of consumers treated poorly everywhere. admittedly, the phrase "can i please speak with your manager" has passed my lips a few times. i was a little anxious about dealing with airstream. not because i didn't feel the floor would be addressed, but i was worried about, well, falling out of love with a brand we've come to admire and love. we drank the silver kool aid, you know? we were also terribly concerned about paying thousands of dollars for something that should have never happened in the first place. after a few calls to the service center, we made a service appointment with the factory and crossed our fingers. come on, no whammies. slow and low, that is the tem-po. jackson center, ohio. stark and beautiful. much my relief, i can't tell you how darn nice everyone was. i don't know if it's a small town thing or an airstream thing or a little bit of both thing, but after seeing the floor rot, airstream agreed to replace the subfloor – which involved ripping out about 1/3 of the existing floor – and cover the majority of expenses. to be fair, i will say that there are well-documented cases with the exact same manufacturing issue we were experiencing. our trailer was leaking from the dinette windows and the rear bumper. neither of those things should happen. we knew it. they knew it. we were prepared to do battle. instead, they assigned two super nice, knowledgable techs to "make good on it" while we ate cookies and drank hot chocolate in the (dog friendly!) lobby. that works for me. we also left with a bit more maintenance knowledge about what needs to get sealed and how often. wally, in the sick bay. super pumped to have their picture taken. killing time, throwing snowballs to gussie. if you ever find yourself having to take your rig into jackson center, it really is kind of a pilgrimage to the mothership. make the best of it. talk to the techs. they're smart and can offer up some really great tips. chat up the gals at the front desk. take the airstream factory tour. buy some stuff in the company store. take your dog to the community tennis courts and throw the ball. eat cookies in the lobby and check out all the vintage goodies in the glass cases. no one wants to deal with costly repairs, but we were so pleasantly surprised by the service and kindness, we wouldn't hesitate to go back again. we just hope it'll be a good long while before we'll need to. where to even start...we've been so neglectful of our sweet little blog. what can i say? life gets in the way and there are only so many hours in the day. and after traveling full-time for almost a year, we needed, well, a little space in our airstream togetherness. but hang on to your hats, folks, because we're back with an entire redesign. so, as the department stores say when they're tidying up and clearing the cobwebs...pardon our dust. more coming soon!